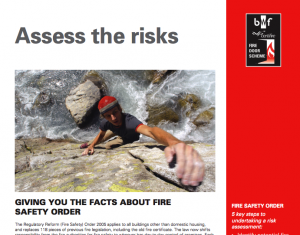 The Regulatory Reform (Fire Safety) Order 2005 applies to all buildings other than domestic housing, and replaces 118 pieces of previous fire legislation, including the old fire certificate. The law now shifts responsibility from the fire authorities for fire safety to whoever has day-to-day control of premises. This document helps you to understand and assess the risks associated with Fire Doors.